He hasn’t scored in the French Ligue 1 since December 8, and in the African Cup of Nations, his performance was average at best. What on Earth seems to be the problem for Ivorian striker Aruna Dindane? Dark magic, that’s what. 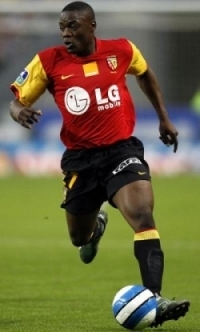 At least according to some people back in Africa… Straight from the headlines of L’Équipe (France’s official sports newspaper), there’s a story that appeared earlier this week concerning the lack of scoring proficiency of the RC Lens player. Citing the weekly Ivorian newspaper FlashAfrik, the article explains Dindane may have been put under a spell cast by a malevolent marabout. For those who don’t know what a marabout is, I’ll refer to you the variety of knowledge a simple Google search has to offer, but suffice to say that it’s an Islamic spiritual leader whose activity sometimes extends to clairvoyance, healing and witchcraft. Marabouts are often an integral part of national team staff in Africa, often under the job description of ‘psychological advisor’, and for Cameroon for example, this role is given to Yannick Noah (a French ex-tennis player of Cameroonian descent, who has also had quite a succesful music career). I guess it wasn’t enough for Cameroon to win the ACN final, but I digress. Going back to the topic at hand, fortunately a woman seems to be ‘keeping guard’ on Dindane: a certain Awa Coulibaly claims to be regularly having dreams involving the Ivorian player, often in situations which would put any ‘Man vs. Wild’ show to shame. “One night, an ox wanted to harm Dindane but I prevented him”. Another time, “he was fighting a bull“. The woman goes as far as to claim she wakes up with cuts and bruises in the morning, as if she was indeed confronted to animals of the bovine family during her sleep. “When that happens“, she says, “I sacrifice an animal and ask the player’s parents to do the same. When they don’t, I wake up with swollen limbs as if I was beaten during the night“. No, I don’t know if the lady’s married and whether child services have visited the Coulibaly house yet. 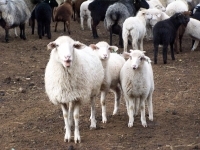 So far, Ms. Coulibaly has sacrificed two sheep and a turkey in the fight against ‘evil’, but there’s no telling how many more animals will have to die on the altar before Dindane’s ‘curse’ is lifted. As for the player himself, he says he’s not paying much attention to the whole thing: “It’s true, there are plenty of stories like this in Africa” declared Dindane. “But I prefer not getting involved. As far as I’m concerned, I can explain my current lack of form with the difficulty of adapting to the French Winter“. “El Capitan” to the rescue… You know, if there is someone who I’ve always had the utmost respect for, throughout all these winless years (let’s face it, until 2006 Inter Milan hadn’t won squat for the past two decades, save for a measley UEFA Cup in 1998), it’s Javier Zanetti. He’s been the heart of the Nerazzurri ever since he transferred from Banfield in 1995, and Wednesday he had the occasion to prove it yet again, by saving his team from their first Serie A loss of the season. Not only that, but losing against Roma would have meant the onset of a mini-crisis among Inter ranks, especially after the draw vs. Sampdoria and the Liverpool catastrophe. Speaking of Roma though, yesterday night proved one thing: 17 matches after the Supercoppa Italiana and 10 months after their 3-1 away victory at Giuseppe Meazza, if there’s one team Inter have a tough time tackling it’s the Giallorossi. Tactically, Roma manager Luciano Spalletti did not want to take any risks with Amantino Mançini (the game against Real Madrid being way too important to miss), and instead fielded Mirko Vucinic in the unusual role of left winger. Rodrigo Taddei occupied the opposite side, while Francesco Totti was once again selected as the lone striker. On the other end, holiday time came back amongst Inter ranks, with Roberto Mancini getting some inspiration from their AC cousins and adopting a 4-3-2-1 Xmas tree formation. Hernan Crespo (out of the Nerazzurri closet because of injuries to Zlatan and Cruz) was confirmed as the one-man striking force, with Dejan Stankovic and Luis Figo providing support. Speaking of the Argentine, after 18 minutes of play Crespo nearly sent the 48,717 San Siro supporters into rapture: connecting with a Patrick Vieira cross from the right wing, his acrobatic bicycle kick slammed onto the inside part of Doni’s post before rebounding wide. A close shave for Roma, but an isolated case of danger in the first half: the Giallorossi were defending well, ready to hit back on fast & lethal counter-attacks. Unfortunately, most of these were being poorly productive… until minute 38 that is. With the game stalled, delivery for the Giallorossi people came once again through their iconic captain, Francesco Totti. Mind you, I say “again” when the last goal Totti scored was over 40 days ago, but all streaks (good or bad) must come to an end some day. With Vucinic in possession, the Montenegrin striker executed a few feints before sliding the ball to Max Tonetto, ready for an express delivery to Totti inside the Inter box. “Er (ex) Pupone” didn’t need an invitation to strike, and armed a precise instep volley inside the left post, where Julio Cesar couldn’t reach. 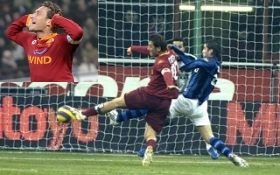 1-0 Roma, and goal nº 201 for ‘Il Capitano’. All the more reason to celebrate for Totti, who with 387 Roma matches has overtaken another Giallorossi legend, Giacomo Losi. For Roberto Mancini, trailing by one at home was a rather uneasy situation. The Inter coach immediately took counter-measures by modifying his tactical set-up: one substitute after the break, two more at the hour of play, but not before Nicolas Burdisso had the chance to draw level shortly before the half ended (his header on a Figo cross from the right wing was over the bar). The Nerazzurri thus switched to a 4-3-3 formation, with David Suazo and Mario Balotelli partnering with Crespo up front, and supported by Pelé in midfield. The biggest problem for Inter however, wasn’t so much Taddei’s near-goal experience in minutes 48 and 60, but rather the twisted ankle of Maxwell in minute 64: with R.Mancini having made his 3 substitutions already, the Nerazzurri were now left playing the remaining half-hour with one man down. Is it just me, or does Inter have a psychological block with finishing their games with 11 men this year? With the numerical advantage, Roma’s chances to put the nail in the coffin multiplied, reaching the count of three from minutes 67 to 75. First, a delightful Totti backheel opened space for Simone Perrotta on the right wing, immediately squaring it for Alberto Aquilani (on for Pizarro) on the edge of the box: the midfielder’s effort was saved by Julio Cesar. Then a few minutes later, Vucinic turned into assistman and served first Perrotta, then Aquilani, for some close-range attempts which were somehow kept out of the net by the Inter defense. The iron was hot for the Giallorossi though, and if they kept striking it, it was only a matter of time before they put the victory on ice. Unfortunately for Roma, fate had other plans for them, and in particular, for Philippe Mexès. In less than 2 minutes, the French defender managed the impossible feat of receiving two back-to-back yellows, one more stupid than the next. First, he re-entered the field without the referee’s permission after receiving medical help (or rather, he cut across the field at the corner flag, in order to get back towards the sideline). Then, a reckless challenge (from behind) on Crespo cost him his second yellow, and re-established numerical equilibrium for Inter. Were the yellow cards harsh? Maybe. Should have Mexès known better? Surely. Will people be debating about this for the next week to come? Undoubtedly. Regardless, the momentum was now back on the Nerazzurri’s side: Crespo went to work by forcing Doni to the save of the night (his redirected header on Maicon’s cross being miraculously parried away by the Roma keeper), but it was only the prologue to the inevitable: a corner-kick by Chivu was headed clear by Juan, by only as far as the edge of the box and a certain Mr. Zanetti: the Argentine midfielder controlled the ball before slamming a powerful half-volley into the bottom-left corner of Doni. 1-1. ROMA (4-2-3-1): Doni – Cassetti, Mexès, Ferrari, Tonetto – D.Pizarro (60’ Aquilani), De Rossi – Taddei (84’ Juan), Perrotta, Vucinic (77’ Giuly) – Totti. (bench: Julio Sergio, Antunes, Brighi, Mançini). Coach: Spalletti. Well, for once in the past month (and I do choose my words carefully), a matchday in Serie A took place without refereeing incidents. Granted there was only one match programmed for Tuesday, but one of a very delicate nature. Derbies are never easy to officiate (especially when they bear the name ‘Derby della Mole’) and coming from a week-end of Dondarini-filled horrors in Reggina-Juventus, the spotlight on the ‘man in black’ was shining twice as brightly for this one. However, I’m glad to report that referee Nicola Rizzoli performed very decently tonight. As for the game itself, it was a hard-fought battle, higher in physical highlights than technical ones: in the end, seeing Juventus and Torino share the points tonight seems like a fair result. Tactically, both managers were dealing with some roster problems before this game. Claudio Ranieri had to deal with David Trezeguet‘s unavailability, coupled with Cristiano Zanetti‘s suspension. As a result, Raffaele Palladino got the head start over Nocerino in midfield, causing Mauro Camoranesi‘s shift towards the middle (partnering Momo Sissoko). 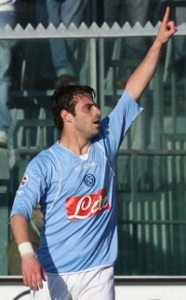 Up front, Alessandro Del Piero paired up with the returning Vincenzo Iaquinta. As for Walter Novellino, the Torino coach hesitated until the last minute, on which strikers to use for this important match. In the end, he surprisingly picked Alvaro Recoba to start over both Rosina and Di Michele: the Uruguayan playmaker was indeed starting the match with Roberto Stellone. The first period was rather enjoyable to watch in terms of intensity, albeit not so much in terms of scoring chances. Recoba and Camoranesi were trying their best to fulfill the playmaking role for their respective teams, alternating bits of brilliance with some dodgy passing. To find the first real shot on net of the game, we had to wait until minute 27: a Camoranesi free-kick from the right wing found the header of Iaquinta, and forced Matteo Sereni to spring to an athletic save over the bar. Before and after the header, Del Piero had a few shooting attempts (wide) from his favorite spot: 4-5 yards outside the box, free-kick position. Torino was trying hard too, attempting to avoid the uncomfortable role of underdog. Gianluca Comotto was playing marathon-man on the right wing, pushing up to provide offensive help then running back to cover his back-line, and the fact the Bianconeri defense was playing very high up the field, considerably helped Torino’s efforts in trying to find space. However, an impeccable Giorgio Chiellini was always there to neutralize the Granata efforts, and thus inevitably the half ended on a scoreless draw. In the second period, little changed to the way tonight’s game was developing: Juventus dominating the ball possession, and Torino trying to hit back on counters. The appearance of their nº10 Alessandro Rosina (on for Aimo Diana) gave the Granata a much-needed creative boost, and they immediately obtained a few shooting opportunities (through Recoba, Stellone, and Paolo Zanetti). On the other end, the productivity of Camoranesi as a central midfielder was dropping somewhat (his buddy Sissoko wasn’t helping much either, missing an increasingly frustrating number of passes), so Del Piero stepped up to the plate, delivering accurate crosses and nearly lethal shots from set-pieces (his 68th minute free-kick towards the top-left corner was brilliantly parried away by Sereni). Speaking of free-kicks, Torino nearly took the lead in minute 74, when a great delivery by Rosina found the Juventus crossbar and was then cleared out of danger (Buffon not even hinting a move). Aside from that huge highlight however, the Bianconeri were the ones who were trying harder: Palladino found the back of the net in minute 62 but saw the goal called off for offside, while a Camoranesi diving header 6 minutes from the end, tested Sereni’s reflexes yet again (Iaquinta and Chiellini missing the open-net tap-in by a hairbreadth). In the final minutes, frustration got the upper hand in the Bianconeri ranks: sparks started to fly between Pavel Nedved and Gianluca Comotto, with the latter theatrically falling to the ground after getting his hair pulled by the Czech midfielder. Inevitable red card for the Juventus player, who will now miss (along with Chiellini, receiving a yellow) the important match vs. Fiorentina next week-end. 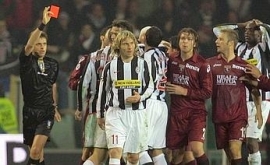 With the loss vs. Reggina, this has been a week Bianconeri fans will want to forget very rapidly. 0-0 the final scoreline. JUVENTUS (4-4-2): Buffon – Zebina, Legrottaglie, Chiellini, Molinaro – Palladino (63’ Nocerino), Camoranesi, Sissoko, Nedved – Iaquinta, Del Piero. (bench: Belardi, Birindelli, Grygera, Stendardo, Salihamidzic, Tiago). Coach: Ranieri. TORINO (4-4-2): Sereni – Comotto, Natali (27′ Dellafiore), Di Loreto, Pisano – Diana (48’ Rosina), Grella, Barone, Zanetti – Stellone, Recoba (81’ Lanna). (bench: Gomis, Corini, Di Michele, Ventola). Coach: Novellino. Strangers in the Serie A beware! The last week-end of the Italian league was really special for Italian players. Super Borriello scored a hat-trick (including a wonder-strike featured in my ‘Goals of the Week’ selection), thereby also seizing 1st spot in the topscorer charts. Meanwhile, Matchday 24 marked the renewal of players that everyone thought long-lost, and confirmed that a certain talent from Bari Vecchia has gotten back on the champions track for good. 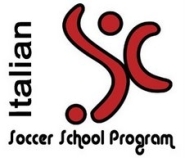 Nicola Apicella from KwSport tells us all about it. Borriello was but one of the many happy surprises provided by Matchday 24, a week-end filled with unbelievable goals, the vast majority of which were 100% ‘Made in Italy’. Indeed, out of the 35 goals scored this week-end, only 5 of them carry the signature of players from abroad: Igor Budan (Croatia, Parma), Cicinho (Brazil, Roma), Hernan Crespo (Argentina, Inter), Mark Bresciano (Australia, Palermo), and ‘Rambo’ Leon (Genoa). But speaking of ‘Leons’, the real lion of this week-end’s fixtures and main man behind his team’s 5-3 final scoreline vs. Udinese, was another Genoa player: Marco Borriello. 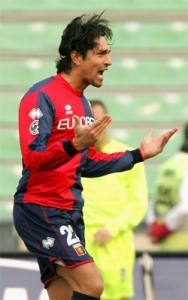 To truly show off his skills, all the Genoa striker was waiting for was opportunity. This week-end, he got that opportunity and boy, were we in for a show!! 3 goals against Udinese, 15 goals in the Serie A this season, reaching King Trezeguet and his “I’ll-make-scoring-look-easy” friends. With his second hat-trick of the season, there’s no doubt Marco must have caught the eye of Roberto Donadoni (who had already called him for the Italy-Portugal friendly). There’s a little more than 3 months left until Euro 2008 begins, and with this week’s performance, the ex-Milan striker is in prime position to be part of the Azzurri expedition to Austria/Switzerland this Summer. Besides, with the non-so-brilliant form period which Alberto Gilardino and Fabio Quagliarella are going through, there’s really no reason why Donadoni should ignore a striker who, at 26 years of age, seems to have achieved full physical and technical maturity. Then there’s Emanuele Calaiò. 38 goals in two and a half seasons with Napoli are a pretty good loot, but lately the ex-Torino striker is having it tough getting some playing time (what with players like Ezequiel Lavezzi and Marcelo Zalayeta doing so well in Southern Italy and all…). This week-end however, Zalayeta was out suspended and Lavezzi dealing with a nasty influenza virus, alllowing Calaiò to get a taste of a starting role again, one which the player will not so easily give up. Indeed, manager Edy Reja’s choice will be all the more difficult when the two unavailable strikers return, because 26 year-old Emanuele was the author of a double on Sunday. Two goals which gave Napoli the edge over Livorno, and which provided an away win that the Partenopei were running after for over 5 months. And what about Roberto Stellone and Andrea Gasbarroni, both protagonists of the most entertaining match of the week-end, Torino vs. Parma? Stellone, age 30, has had a pretty decent career thus far, albeit one filled with multiple injuries. Roberto is a guy who doesn’t score many goals, but when he does score his efforts are always quite spectacular. He practically saved Walter Novellino’s job as a manager (recall his goal vs. Reggina), and since then the Torino coach has always kept him in the starting line-up. With extremely good results. As for Gasbarroni, his technical talent isn’t up for discussion. His continuity certainly is, but that’s the deal with unpredictable players like Alessandro: when they’re in a moment of form (such as Saturday at the Turin Olimpico) they can really wreak havoc. Two vital goals, one stunner on a free-kick effort. Joining the ‘Italian scoring fun’ this week-end, teams like Cagliari (desperately clinging onto hopes of avoiding relegation, getting some help from Alessandro Matri), Reggina (lead by the Franco Brienza/Nicola Amoruso duo), Atalanta (Sergio Floccari), and Empoli (Sebastian Giovinco). Let’s finish up with a tale of generations: youngn’s & oldies. First there’s Antonio Cassano, who scored Sampdoria’s lead vs. Inter and otherwise displayed another excellent performance. His head certainly seems to be back in order, and that is music for Donadoni’s ears. 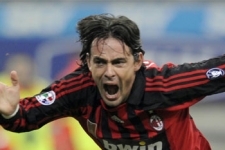 And then there’s the goalpoacher par excellence, returning for an appearance (a game-winning appearance I might add): Filippo Inzaghi provides the stoppage-time goal giving AC Milan the win vs. Palermo, and proves that no matter how old you get (Super Pippo’s 34), you still have a place at AC Milan (ok, cheap shot). Anyways, with 30 goals out of 35 scored by Italians, matchday 24 is testament to the fact home-grown talent still has a big say in the Serie A. Sepp Blatter should be happy to be reading this, but as we all know… he hates Italy, so… FU Blatter, and Viva l’Italia! Based on Gazzetta’s info, there are currently 22 Italians playing in first divisions abroad, and 12 of them stepped on the field this week-end. Boo. No goalscorers, no assist-men, no nothing this week. So this time, we’ll talk about someone other than Giuseppe Rossi and Luca Toni for once. Like goalkeepers. Let’s start with Spain. Recreativo de Huelva’s not doing so good in La Liga standings, but this week-end the 17th-ranked team managed to obtain a valuable point away to Valencia, thanks in particular to the super saves of their nº1 man Stefano Sorrentino. Can the ex-Torino and AEK Athens man keep his team away from the relegation zone? On to France, where Flavio Roma‘s week-end wasn’t all that great, but could have been a lot worse: AS Monaco obtained a good away draw to Paris Saint-Germain (with on-loan Juve midfielder Sergio Almiron scoring the tying goal for les monégasques). Nº1 (nº30 actually) and team captain Flavio could do little on Amara Diané’s lead, but his springing reflexes denied Mario Yepes’s header, thus preserving the final 1-1 scoreline. Finally, on to Switzerland where Andrea Guatelli had a rocky afternoon on Sunday. With starting keeper Johnny Leoni being sent off in the 3rd minute, FC Zürich had no choice but to insert the ex-Pompey keeper vs. Luzern. Guatelli immediately cost his team a goal by failing a save on Lustrinelli, then (through no fault of his own this time) conceded another goal in the second half. Zürich then brought one back with Djuric, and Guatelli’s subsequent saves kept his team’s hopes alive. In the end however, the match ended 2-1 for Luzern.